For example, high-carbohydrate honeydew produced by hemipterans is a valuable food resource for invasive ants and native species. Imported fire ants are originally from South America. 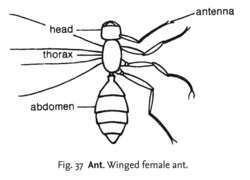 Some ants can glide through the air to a tree trunk, Yanoviak discovered in earlier research that involved dropping ants out of trees (SN: 2/12/05, p.
Some butterflies attract ants to their caterpillars, where the ants guard them inside the ant nest, and some woodlice live only in ant nests. Ants possess a sophisticated pheromone system that functions every bit as well as the GPS unit in your car. Tribal people, who cannot afford a regular protein diet, often consume adult ants in the form of chutney. We found the highest numbers of fire ants in the area near the water," says Luis Calcaterra, a biologist at SABCL who works closely with the lab's director Juan Briano. When other ants detect the "dead" chemical without the "not dead yet" chemical, they haul away the body. Spray vinegar mixed with water around bowls of pet food to keep ants from feasting there. Fisher knew that in each of these unique habitats, different types of ants would be scurrying by the thousands in the soil and trees. Late in arriving but no less welcome for it, ``The Ant Bully'' is the summer's best family movie -- funny, action-packed, sometimes disgusting, sometimes affecting.